After connecting a 3.5" SATA HDD to my laptop via the converter, I sometimes get electric shocks from some parts of the laptop case. That uses 4 wires for powering an HDD. Some say that it would be dangerous for HDD because of the lack of one wire. Is it dangerous to use this converter? Why do I get electric shocks? Did I damage my laptop with this converter and small electric shocks? EDIT: Now shortly after I'm writing this, the adapter made a spark/bang noise and went off. It doesn't turn on again. How can I tell if it damaged my laptop through adaptor > HDD> USB? The pictured adapter is not at fault... The missing wire is the 3.3v supply, and most hard drives can operate without it. 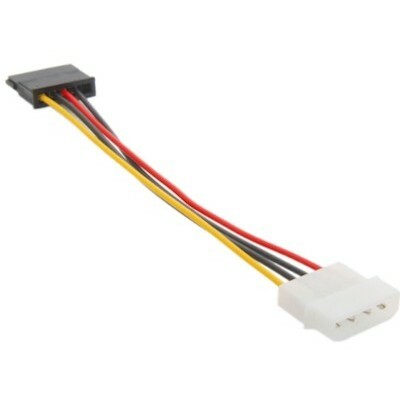 It will be the mains to Molex adapter that is dangerous. If it was still working I'd suggest that you try unplugging your laptop from power (thus running on battery) - the "shocks" will likely go away. Unfortunately too many cheap power supplies have this behaviour. The fact that the supply has since died doesn't bode well either... Put it in the bin. Again, many cheap supplies aren't built to sensible standards, especially if they are imported or overly cheap. It's going to be very difficult to determine if any damage has been done to your laptop or the hard disk. Try the USB port - if it works, then great. I'd like to know what was the cause of electric shocks from laptop chassis minutes before the adaptor failed? It's a complex topic, and not really suited to Super User... but it can be thought of like a ground loop. What are the possible known/common damages that could have happened? Ultimately a "bad" power supply like this can cause issues ranging from "almost nothing", through sparks, to death. Do you recommend opening the adaptor to see and report its insides for further investigations? No - throw it away. The best you can do is report the issues to the seller. Due to the unbranded nature and flooding of the market with such supplies, there probably isn't anyone you can "go after" or even report it to. Not the answer you're looking for? Browse other questions tagged hard-drive laptop usb sata or ask your own question. Can I use desktop PC's power supply to power up SATA-to-USB cable? How do I check whether the enclosure failed or the hard drive failed? How to safely turn off USB-connected, ATX PSU powered 3.5" hard disk drives built as internal?